Experience Little Italy’s brand new, premier event, Solo Italiano: Dinner in Rosso presented by PenFed Credit Union on Saturday, Oct. 6. From 5 p.m. to 10 p.m. in the Piazza della Famiglia. 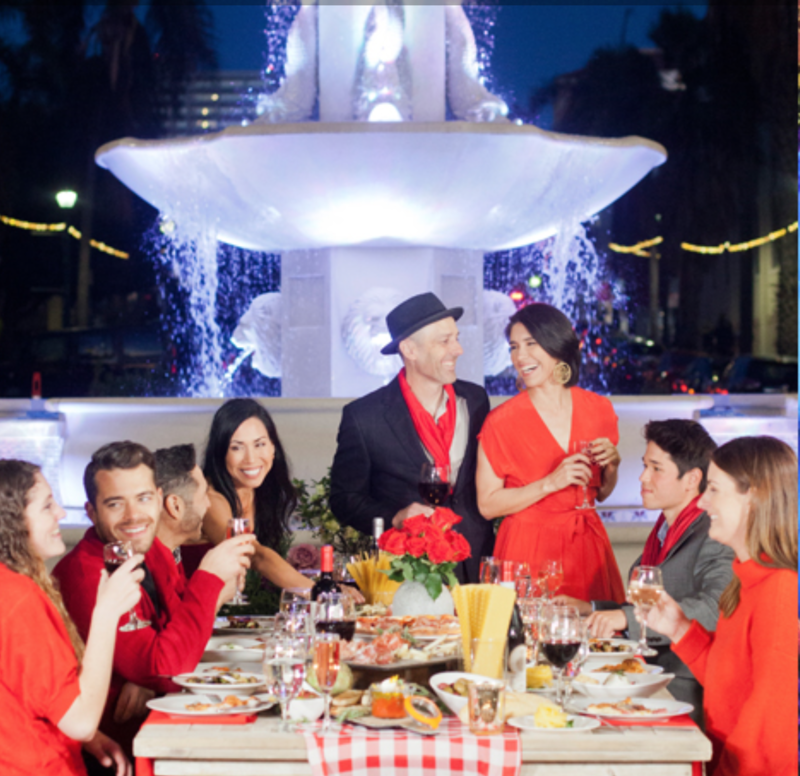 Solo Italiano: Dinner in Rosso presented by PenFed Credit Union will transform the Piazza della Famiglia into a magical Tuscan-inspired evening featuring a one-of-a-kind curated and immersive dining experience that encourages guests to dress in their best red attire. While creating a truly authentic Italian experience, the flagship event will also help raise funds for the Little Italy Association to continue its efforts to enhance and preserve the rich history and charm of the community. Tuscan farm tables will line the Piazza della Famiglia at Solo Italiano: Dinner in Rosso presented by PenFed Credit Union for an exclusive family-style dinner featuring endless Italian courses, sips of Italian beverages, strolling Italian entertainment, interactive performances, Gesso Italiano (Chalk Art), dancing and more. During the communal dining experience, guests can expect to be waited on and engage with cheese experts who will offer each table a selection of gourmet cheeses to taste—enhancing their experience. Throughout the dinner, opera singer, Natalie Moran Clegg will dazzle the crowd with an exquisite performance from one of the balconies in the Piazza. Headliner and Naples born and raised singer, Pasquale Esposito, will take the stage for a live performance; inviting guests to dance the night away on the dance floor. Prior to the orchestrated dining experience, attendees are invited to explore the Luxury Galleria, located on W. Date Street between Columbia and State Streets, for cocktail hour from 5 p.m. to 6 p.m. featuring wine from Mignanelli Winery, olive and vinegar tastings and a pop-up Italian soda bar. The Luxury Galleria will also feature a variety of activities—live entertainment, an exotic Lamborghini model range display, an Italian fashion show by Roberto Cavalli, live Gesso Italiano (Chalk Art) and more. Guests can snap their picture-perfect Italian photo-op at one of the photo vignettes with Lamborghini and Vespa. A limited number of Solo Italiano: Dinner in Rosso presented by PenFed Credit Union tickets are available. Tickets start at $200 and can be purchased here. The Luxury Galleria will open to the public for free after 6 p.m., so the community can enjoy some of the elements of the event like the Gesso Italiano (Chalk Art), photo vignettes, Lamborghini display, Roberto Cavalli fashion show and more. Each year Solo Italiano: Dinner in Rosso presented by PenFed Credit Union will take on a new Italian-centric theme to ensure a unique experience every year. The Little Italy Association’s goal for the future is to create a festival to take place the day after Solo Italiano: Dinner in Rosso presented by PenFed Credit Union to give more San Diegans and visitors the opportunity to immersive themselves in Italian culture. The Luxury Galleria will give guests a glimpse into what a Solo Italiano day festival will look like in the upcoming years. The event is made possible through the support of its generous sponsors and partners. Sponsors include PenFed Credit Union, Loacker, Frank Subaru and San Diego Arts & Culture Commission. Partners include Lamborghini La Jolla, Roberto Cavalli, Vespa, Roots n Tours, Italian Travel Solutions, Venissimo Cheese, La Pensione, Domori—The Fine Chocolate Company, Mignanelli Winery and Dolce Italian Sweets.